If you’ve created a logo animation or intro logo and you love it but can’t afford to download it in high quality HD resolution. We now offer several options on how to get a coupon code with a discount. At Introbrand we support the upcoming generation and provide a discount coupon code for rendering any of our animations with a 20% off discount coupon from Introbrand. Just contact our support at [email protected] from your .EDU email or otherwise proof of any consecutive academic or non-academic study program. A simple way to get your one-time 20% discount coupon is to share publicly Introbrand on your Facebook wall or Twitter. You can share any page or link from the Introbrand website and write your own opinion about Introbrand. After simply send the link to your post to our support team and we'll send your Introbrand voucher code along. Share your experience with us on our Introbrand Facebook Page. Write a mini review about your experience with Introbrand and give us some stars. Your support will be rewarded with a 10% off coupon code. Write a short review about Introbrand on your own business blog and get your free high quality render up to 4K UHD resolution. Your review should include a link to the Introbrand website, and one image/video taken from our website. When you're ready send us the link to your blogpost and we'll send your coupon via email. Only for blogs with unique domain can apply. Are you a business, video producer or design-, animation, vfx studio or freelancer and you wish to expand your range of services or plan to resell our animations as stand-alone or as part of your clients' video projects? We offer a flat 20% discount on all purchases after your 10th purchase. Whenever you made your 10th purchase, please contact us at [email protected] so we can create your reseller account. Are you an influencer, publisher, blogger, YouTube or Instagram personality? Join our new Introbrand affiliate program via ShareASale, we pay you a 20% commission on all sales that came from your website or channel. 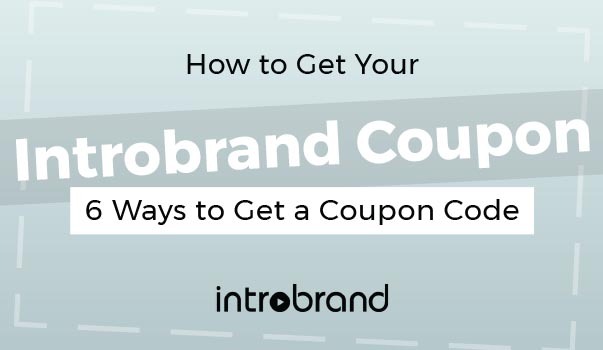 How to use a coupon code on Introbrand? After you've created a preview video you would like to buy. First choose your final video resolution, then proceed to check out page, fill out the personal data and payment form. Below the payment details, just insert your code in the field "APPLY SUPPORT CODE" and click the -APPLY- button next to it. Did you find yourself among above categories? Then go ahead and go with the most suitable option to export your animated video at a lower price. If you're getting an error message saying “Coupon code is not valid” when inserting the coupon code, you are likely to have entered a wrong or expired coupon code. Keep in mind that all coupon codes only work only one-time unless otherwise stated.